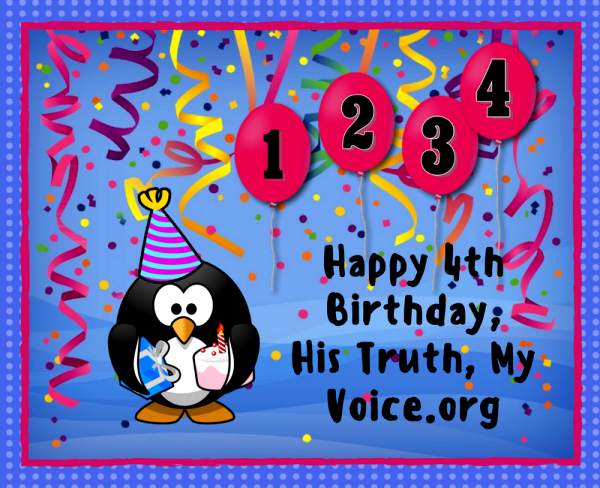 Today marks the fourth birthday of this blog, His Truth My Voice.org. In spite of its being birthed during one of the most challenging times for my family and me, it was and continues to be a labor of love on my part; one born out of a need to share with others some of the truths I have learned about God through my long-time study of His Word. Unfortunately, due to a major move at the end of last summer (one which took me several months to recover from) and a recent knee replacement surgery, I have not been as productive as I would have liked to have been. 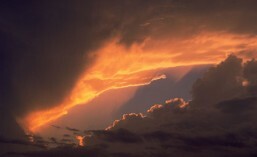 However, now that I can sit at my desk for a while relatively pain-free, that will soon change, and we can resume our series of exercises on the spiritual discipline of Service. While the discipline of Service may not seem like a particularly stimulating one, since the exercises remaining in its workout session will be dealing with Satan’s tactics for disrupting the Service of the Church, and such a controversial issue as Women in Ministry, I am confident that they will greatly aid us in the stretching and toning of our spiritual muscles. At this point, I would like to thank all of you who, throughout my hiatus, have continued to visit this site and pray for its ministry—your support has been greatly appreciated. And, I would like to offer you a little trip down memory lane by sharing, once again, the first post I published on May 11, 2013, The Prophet is In, Just Bring Your Own Snacks. This entry was posted in Miscellaneous Reflections, Personal Reflections and tagged Happy Birthday, Service, Women in Ministry. Bookmark the permalink. Thanks, Hal, for the good words. It has been hard to get focused once again so your prayers to that end will be greatly appreciated! Happy Birthday to your blog Judy!! Glad to hear you are feeling better. Thanks, Vince–I am still a work in progress but in a lot better shape than I was a couple of months ago! Thanks for all your prayers!